Welcome to Singer Factory Distributor. We serve the Greater Chicagoland’s recreational, commercial and industrial sewers of all levels, as well as sewing contractors and sewing manufacturers. Committed to service, we are ready to assist with all your sales- and service-related needs. As the Regional Sales & Service Center for home and industrial sewing machines in Chicago, IL, our full-service location offers a great selection at great prices. Our showroom is open seven days a week with an impressive display of sewing machines and related products by our industry’s leading brands. Friendly, experienced sales personnel will help you choose from our large inventory the right machine, attachment or accessory to complete any sewing project. Our award winning service department is always available to keep your new or old equipment running smoothly. Financing and layaway options are available as well as free sewing lessons by qualified machine instructors in our Sewing Studio. We teach sewing application as well as machine operation. 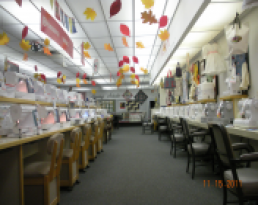 Stop in today for sewing information and inspiration. To learn more about what we can offer at Singer Factory Distributor, visit our Services page. Contact us anytime with any question you may have about the services we can offer. Where will you buy your next machine?